The case of Pyndapborlang Hubert Khongsit, a 15-year-old student of St. Anthony’s HS School, Laitumkhrah, who died an unnatural death on August 21, 2018, has taken a new turn with his mother alleging that he was killed by her relatives. Maria Khilan Khongsit, the mother of Maria Khilan Khongsit alias Pyndap lodged an FIR at the initiative of CSWO, with Laitumkhrah Police Station in Shillong on Monday. In the FIR, Khongsit claimed that her son has not committed suicide by hanging as reported. Khongsit in her FIR stated that before August 21, her son had stayed for two weeks in the house of her husband’s sister, Bilda Lyngdoh Nongum, which is in Nongrimbah West, Block V, Laitumkhrah, as she had scolded him for not studying properly. Pyndap was a Class X student of St Anthony’s Higher Secondary School, Laitumkhrah. Khongsit has been separated with her husband, Brester Lyngdoh, for about a year. “I told the teacher and the Principal that my son was staying with his aunt, Bilda Lyngdoh Nongum. Then I called up my sister-in-law Bilda, who came with her daughter Darishisha Lyngdoh Nongum. The teacher and the principal had told them not to beat him up or scold him but to bring him next day to school to be counseled,” stated Khongsit. Khongsit stated she had dropped them near Nazareth Hospital and went for her work with a hope that the next day her son would be counselled in school. 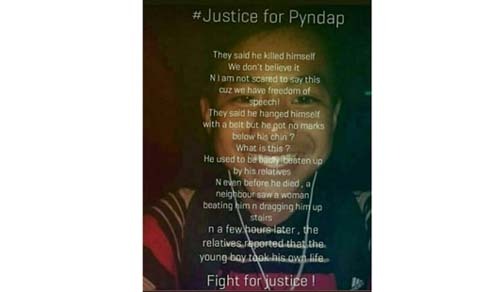 But a neighbour of Khongsit, Jonika Nongbet, informed her children at around 7.30 pm on August 21 that Pyndap committed suicide by hanging in the house of his aunt (Bilda Lyngdoh Nongum). “I also received a call from Claron Thabah (neighbour) of Bilda between 5.45-6.30 pm telling me that she saw my son being beaten up by Darishisha,” the FIR stated. After getting another call from Albert, Pyndap’s brother, about the incident, Khongsit reached the spot at around 8.30 pm and found that the body of Pyndap which was laid on the bed and wrapped with a cloth. Pyndap’s mother also alleged that the window, where her son hanged himself as claimed by the deceased’s relatives, is short and he could not have hanged himself from there. “Moreover, there are no signs to indicate that my son hanged himself. In fact, the room where he was alleged to have committed suicide in is the room of Bilda Lyngdoh Nongum,” the FIR said. The deceased’s mother suspect that her son was “badly beaten and murdered by Darishisha Lyngdoh Nongum as she was also seen by Claron Thabah, Rebecca, Melicia Kshiar, dragging him from the road and slapping, beating him on the 21st August 2018 between 5.35pm -6.30pm”. The mother has urged police to arrest Darishisha and those who helped in destroying the evidence so that justice is delivered to her son. She has also forwarded the copy of the FIR to the State Commission for Protection of Child Rights (SCPCR) and the Director General of Police (DGP). The Civil Society Women’s Organisation (CSWO) has condemned the assault on the minor which led to his death. The NGO has also demanded justice for Pyndapborlang Khongsit. Agnes Kharshiing, president, CSWO, informed that they contacted the Officer-in-Charge of Laitumkhrah PS on receiving the photo of the boy circulated by friends seeking justice for him and the OC told them that they were waiting for the post-mortem report.